Beginning his Senior playing career with St. Anthony’s S.C., Rich was quickly signed to a contract with the Kutis S.C. from 1967-71 where he was on two National Amateur Cup finals in 67 and 69 along with a 67 Open Cup quarterfinalist. Rich ended his Senior playing career with Stag A.C. from 71-73. Rich was a member of the first years of soccer at Quincy College, winning two NAIA Championships in 66 and 67 and a finalist in 68. As a tri-captain, Rich was voted MVP in 68 and All-Midwest and All-Tournament team in 68. 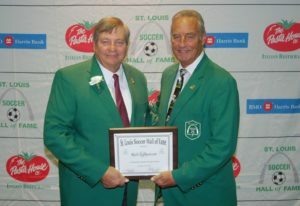 Rich was inducted into the Quincy Hall of Fame as a player in 1994, and in 2006 as team member of the 1966 team and in 2013 a member of the 1967 team. After graduating, Rich found his way into the coaching ranks, being named Head Coach at Augustinian Academy from 1969-1972 and Hazelwood Central from 72-77.